Slaying the Badger: LeMond, Hinault and the Greatest Ever Tour de France , by cycling journalist Richard Moore, is a fascinating look at one of the most intrigue-filled Tours ever. I have to admit that I knew next to nothing about this amazing story, simply because I didn’t really know that professional cycling really existed in 1986, but I’m glad I do now. The book’s central tale is about this Tour de France that split a team in two and pitted polar-opposites, (and teammates!) 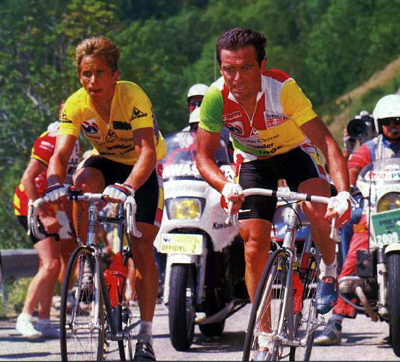 American Greg Lemond and Frenchman Bernard Hinault, against each other. It all revolves around a promise Hinault had made at the end of the 1985 Tour – a Tour which he couldn’t have won without his loyal teammate’s help (Lemond of course). The promise, caught on film more than once, goes like this: “since Greg helped me win this year, I will work for him in 1986”. Well, guess what? Life’s not that simple apparently and once Hinault started his final Tour (he had proclaimed that 1986 would be his last many years before) his idea of ‘help’ took on a whole different definition. The book is based on lengthy interviews with both protagonists, plus a large supporting cast (including the one cyclist I did know in 1986…fellow Canadian Steave Bauer) and makes for a very balanced account, I think. It also serves as a decent biography of two men who, between them, won 8 Tours de France, since the first half of the book is devoted to background on both of them. The book is well written and details a time when riders definitely had more panache than they do today. The descriptions of The Badger’s (Hinault) suicidal (actually, mostly homicidal) attacks are worth the price of the book alone! This entry was posted in Reviews and tagged slaying the badger review. Bookmark the permalink. Thanks for presenting this book Gerry. I’ll definitely pick it up, as I remember this time well. This was one of the last great duals that seemed to be a staple of the Tour’s drama of years gone by. As much as I still love the Tour today, nothing in the past 20 years comes close to the drama that was played out over the roads of France back then. It’s what got me really interested in the Tour. In fact the 85 and 86 Tour’s and the associated drama between these two great competitors was riveting. Coverage of the Tour was limited back then in North America and we only saw a summary of the week’s highlights in a two hour special on the weekend. So it was super-charged with only the best action. Greg Lemond was the guy that started the cycling movement on this side of the Atlantic and he did it drug free. Amazing stuff! Funny that I completely missed it. I was never really a big sports fan, so perhaps that’s why. I remember the name ‘Lemond’, as well as ‘Bauer’, but really couldn’t tell you much more about them except that they rode bikes somewhere. I’m sure you’ll enjoy the book even more then, since you ‘lived’ it in a way already. I’m curious to learn what possible rationale could be given for going back on your word that allow for people to take Hinault’s side. I guess I’ll need to read the book and find out! I won’t run it for you, but it seems to come down to Hinault’s story versus what everybody else saw happening. His rationale didn’t sound very rational to me!